Floranext is an all-inclusive software solution for florist businesses. It involves website designing, POS, accountancy, and orders and event management. It can help with managing orders both from the web and your physical shop. It has been designed by florists themselves keeping in mind the day to day needs and tasks they usually have. All your e-commerce operations can be dealt with using this solution. Additionally, you can track and manage orders for weddings and other large events. The POS includes a variety of features like customer management, reminders, credit processing, and proposal manager. It basically brings together everything that you otherwise would have to pay for separately. Floranext is the ultimate tool for managing and growing your flower business. The reason why it is so efficient is that it has been planned and designed by florists themselves. Everything that such a business could possibly need can be found in some of the Floranext packages. With the POS, you can effectively take orders and process them. You can use the system both for your web store and physical shop, and process online orders automatically. Depending on the features you need, the company offers several different packages with varying eCommerce functionality to choose from. Basically, you will only pay for the features you genuinely need. The Wedding/Event proposal tool is a great addition to the POS that can also be purchased separately. With this, you will look a lot more professional and your will be able to deliver high-class service. It only means one thing: more weddings, birthdays, ceremonies, and more customers. The POS+Website plan is very smart, as it saves the money of running a physical and website business in parallel. Everything is interconnected and your shop runs smoothly. You can gather customer data through the software and use it also for email marketing purposes. 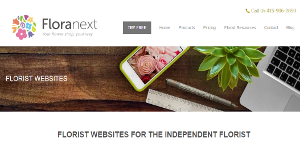 Floranext provides exclusive and praise worthy themes for your website which represents the floral business. Your website is your business’ online identity and it is important to have it optimized, especially if you are also doing e-commerce. You do not have to pay separately for SEO; this is also covered in your plan. It is an ideal package for an independent florist who does not have time to do all of this with different solutions. It is crucial to note that almost no service in the POS Software category will be a perfect solution that can meet all the requirements of all business types, sizes and industries. It may be a good idea to read a few Floranext reviews first as some solutions may perform well just in a very narrow set of applications or be created with a really specific industry in mind. Others might work with a goal of being simple and intuitive and therefore lack complicated elements needed by more experienced users. You can also come across solutions that focus on a wide group of users and provide a rich feature set, however this usually comes at a more expensive cost of such a service. Ensure you're aware of your needs so that you choose a service that has all the functionalities you look for. How Much Does Floranext Cost? We realize that when you make a decision to buy Sales Software it’s important not only to see how experts evaluate it in their reviews, but also to find out if the real people and companies that buy it are actually satisfied with the product. That’s why we’ve created our behavior-based Customer Satisfaction Algorithm™ that gathers customer reviews, comments and Floranext reviews across a wide range of social media sites. The data is then presented in an easy to digest form showing how many people had positive and negative experience with Floranext. With that information at hand you should be equipped to make an informed buying decision that you won’t regret. What are Floranext pricing details? What integrations are available for Floranext? If you need more information about Floranext or you simply have a question let us know what you need and we’ll forward your request directly to the vendor.